Beautiful young thinkers have romance. Before Sunrise (1995) is a movie for anyone that appreciates intelligent conversation, travel and chance encounters. Ethan Hawke is young American abroad, Jesse, while Julie Delpy is the eye-catching French girl, Celine. They talk for twenty minutes on the Eurail – his stop is in Vienna, her destination is beyond – but with a good line he convinces her to get off the train with him. To do nothing but tour the city, walk and talk. This turns into an all-night date that is as divine a romance as anything the cinema has given us. The writer-director is Richard Linklater. I’ve met him three times. He’s hunkier, more charming, more eagerly sociable, more gregarious than most filmmakers. He’s got good looks and confidence. This description sets him apart from his contemporaries, and I think that’s important. He’s a guy that’s been around many walks of life. His earliest movies “Slacker” and “Dazed and Confused,” although entirely different scenes, also contained a bright young vernacular. Linklater’s movies talk smart and up to speed with youth culture today. His characters have life goals, world opinions, and most daringly, esoteric musings. That’s funny. Most movies don’t feature characters that speak rhetorically for the heck of it. People who go to movies for plot over character aren’t going to catch its vibe so easy. Jesse and Celine roam through the city – stop at the record store, a cemetery, a carnival, coffee bars, a run-in with a gypsy who foretells prophecies, another run-in with a spontaneous poet for hire. Forgoing, it continues that way. What marks its brilliance is the conversations, the asides, the waxing of world philosophy by two attractive people getting to know each other. The suspense is when the kiss is going to come, and if there will be promise of more. 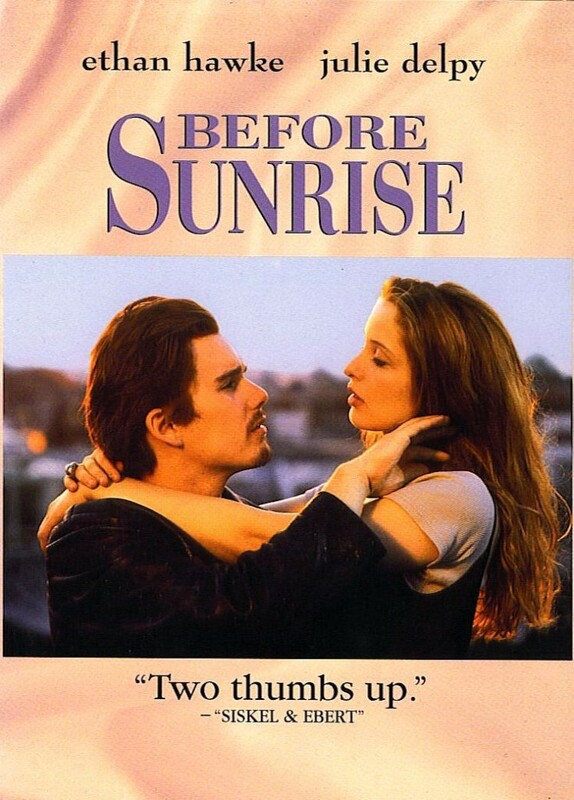 When “Before Sunrise” came out, nobody figured it would spiral into a cult classic. That it would carry in peoples’ hearts years after one viewing. That it would inspire real life love stories by couples’ duplicating their scenario. The sequel “Before Sunset” would come out nine years later, to catch up with the characters in a reunion sense only to slowly peel away the characters’ long-dormant lust for each other, and “Before Midnight” revisiting the characters again another nine years later is now in theaters. Stories of first love melts us – it’s just something that captivates us as romantic humans – which is why “Sunrise” has to be the ultimate favorite. You gaze at the film adoringly as you would a lover. Rated R for a few flirtatious F-words and… French kissing. Otherwise it’s suitable for anybody with imagination and a set of loins. Film Cousins: “Roman Holiday” (1953); “My Night at Maude’s” (1969, France); “Before Sunset” (2004); “Before Midnight” (2013).